Most insurance policies carry an excess. But do you know what it is and how it is applied? The excess is the amount you pay if you make a claim that is accepted by the insurance company. It is your financial contribution towards the loss. The excess will be specified in the policy document and is usually noted on your Certificate of Insurance. In some cases, the insurance company offers a standard excess (say $100 or $200 etc) and sometimes the insurance company will allow you to select the excess. Usually when you select a higher excess, this reduces the premium because you are carrying a higher portion of any possible loss. The reverse applies if you opt to reduce the excess or select a Nil excess. This is because the insurance company is carrying the entire risk of loss and financial outlay to compensate you. Sometimes a policy has a single excess amount. Other times, there will be multiple excesses which apply to a claim. An example of this would be motor vehicle insurance where you have the standard excess and you may also have an age excess for younger drivers or an excess for unlisted drivers. In this case, the excesses are cumulative (if applicable to the claim). 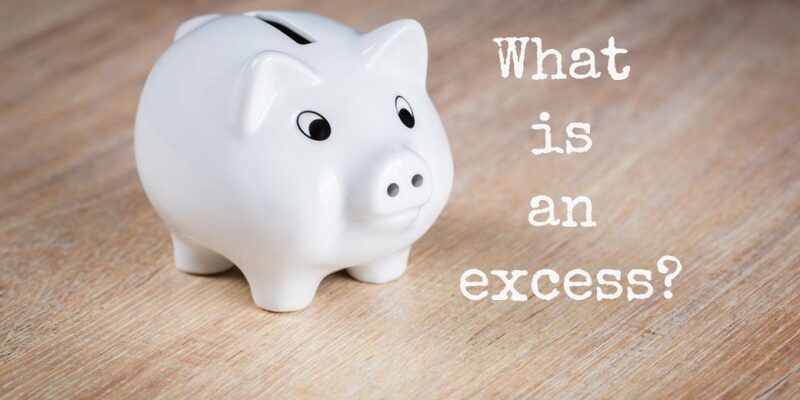 If that’s not confusing enough, the excess may not apply to claims against all policy sections and in some cases the excess may be applied cumulatively if your claim involves multiple policy sections. So how does it work? Let’s look at some examples of how an excess may apply to travel insurance claims. Susan was involved in a bicycle accident in England. Susan received medical treatment and replaced her phone screen as it was damaged in the accident. Susan claimed compensation from her insurer for the following costs. Susan’s policy has a $100 excess which applies to medical expenses claims and also personal property claims. There are two possible ways in which an insurance company may pay this claim. The first is that the excess applies “per event” and the second is that the excess applies “per section”. You can see in the case of “per section” excess, the insurance company pays less. Whether the excess applies “per event” or “per section” will be noted in the policy document. Go Insurance applies the excess (where applicable) on a “per event” basis (ie Example 1). Michael was carrying his backpack whilst sightseeing around Barcelona. When he returned to his hostel, he discovered that his backpack had been sliced open and his camera had been stolen. Michael made a claim against his policy for the loss of his camera. Michael had bought the camera duty free on his departure from Australia a few days earlier and was brand new. It cost $1000.00. The policy Michael purchased had a “per item” sub-limit of $500 for loss or theft of cameras. It also has a $100 excess. There are two possible ways this claim could be settled. This depends on whether the insurance company applies the excess to the loss or to the claim. Whether an insurance company applies the excess to the claim or to the loss may not be evident in the policy document – in this case, it’s best to check with the insurer directly. Go Insurance applies the excess to the loss (ie Example 1). Tom and Sarah had planned a road trip across the US. Unfortunately, Tom broke his leg the week before departure and the trip had to be cancelled. Tom and Sarah claimed $6,500 which was the non-refundable cost of their trip. Tom and Sarah’s policy has a $100 excess. Travel insurance policy excesses are generally “per person” and so the claim would be processed as follows. All of these examples involve reimbursement or compensation to the policyholder. In this case the application of the excess is a deduction to the amount paid. Sometimes, the insurance company may ask you to pay the excess to another entity – eg a hospital. The excess may not apply to all policy sections and in some cases the insurer may waive the excess. How the excess applies to a claim is usually simple but sometimes it’s a bit tricky. If you have any questions about how an excess may affect you, it’s best to check with your chosen provider.